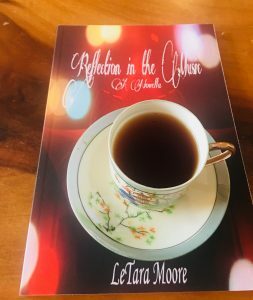 I won a copy of Reflection in the Music, by LeTara Moore, through Goodreads. Melissa is lost and hasn’t the first clue of where to find herself. Pea can’t let go of her past mistakes, which is suffering her present and future. Sherri thrives on her vanity, but even the most vain finds herself falling short. Jane just wants to start over and make amends, but how does one mend a broken heart? Life has a funny way of connecting the lost and confused. Some mistakes are meant to be made and some wounds aren’t meant to be healed. Some wounds don’t want to heal. Despite the shortcomings and differences, these ladies find themselves all singing the same tune. Beauty, passion, art, fear and love all had their hands in the composition of the ladies’ song—a song that reveals the deepest layer of each one’s being. This was….well, honestly I don’t know what this was. True to it’s title it contained a lot of music references and the characters used songs to illicit memories. But rather than a story, it’s almost more a series of interconnected vignettes. The problem is that it reads as if this was not what the author intended, but what resulted from poor development and storytelling. Maybe I’m wrong, but that’s what it felt like to me. Further, the book could do with another round of editing. Especially to look at consistency in tense and page numbering. There are those who will likely enjoy this more than me, especially readers who gravitate toward innocent, slightly religious characterization. But this was bust for me. This entry was posted in books/book review and tagged book review, won on December 29, 2017 by Sadie. Thanks for the honest review! I meant to tell a short story that would be a snapshot of a short period of time. I was going for something a little different than what I normally read. I’ve polished the book since its initial release. It has a new cover, improved interior design, and has undergone some E editing. I’m always looking for honest feedback. Overall, it has been positive, but I welcome the neutral and negative. Otherwise, I’ll never grow as a writer. Thanks so much for taking the time to read and share your thoughts.